Maybe your current watch band is worn out and in need of a change, or maybe you would just like to update the look of your watch band, either way you can accomplish your goal with a new sport rubber watch band. 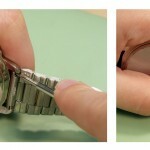 These watch bands are most commonly connected to watch cases with spring bars that are often hidden under the watch case. 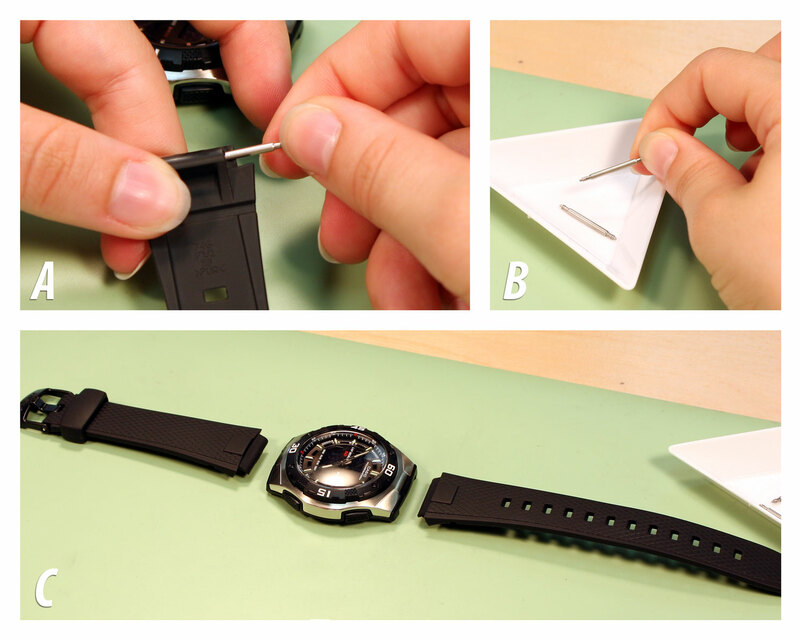 Use this guide to learn how to remove and replace your rubber watch band. 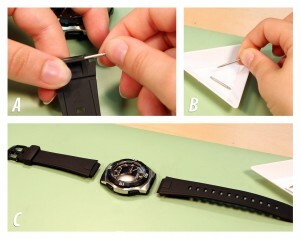 To change your watch band, first you need to remove the existing band. Hold the watch case in your hand so the back is facing toward you and one half of the watch band is accessible. Look at the band where it meets the watch case. You should see the edges of the spring bar on either side of the watch band. 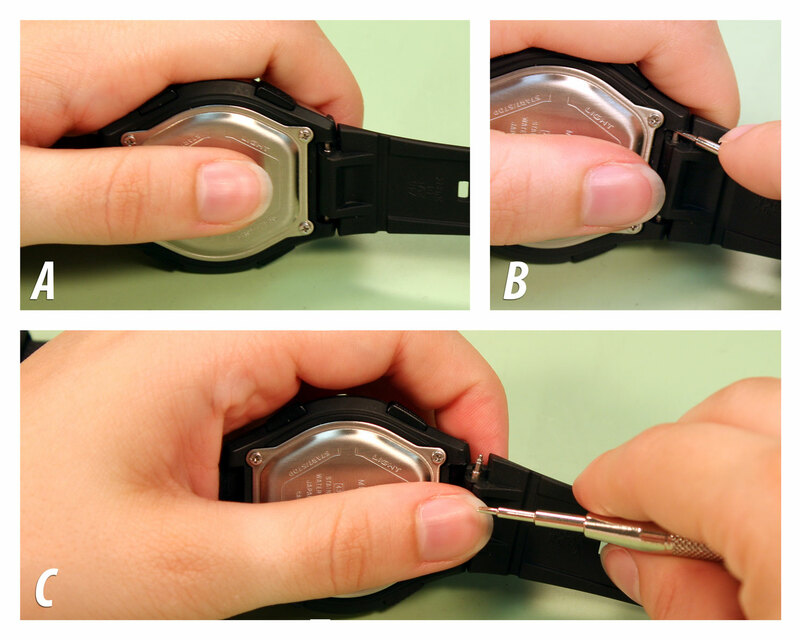 Turn your watch case on its side for stability in this repair. Take your spring bar tool and insert the forked end into one of the openings where you see the spring bar above the donut ring on the bar. Using the donut ring as a catching point for your spring bar tool, push down so that the spring bar contracts on itself. Push the spring bar out toward you until the spring bar is free of the watch case. Once the first part of the band is partially free of the case, you can easily pull it out of the case completely. Remove the spring bar from the band and place it in your parts tray before setting the watch band aside so you will remember which side of the watch case it belongs on. Turn the watch case around in your hand so that the other half of the band that is still attached to the case accessible. Take your spring bar and repeat what you did before: find the edges of the spring bar that are sticking out of either side of the watch band and insert the spring bar tool so that it will catch on the donut ring. Push the spring bar down on itself with the spring bar tool. When it is compressed, twist the spring bar tool to push that end of the band out of the case. 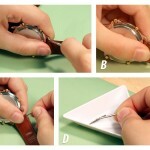 Release the spring bar and carefully pull the second half of the watch band out of the watch case. Take the spring bar out of the band and set it in your parts tray before placing the band off to the side with the first half. 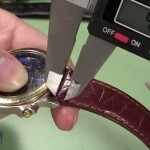 When the band has been removed, you will want to measure the watch band to find the right size replacement band. Then, with the size of the band, you can check out our wide selection of watch bands to find the perfect replacement band. NOTE: If your new watch band came with spring bars, you can use them. Otherwise, you can use the old spring bars as long as they are in good condition. Once you have your new watch band, you can place it on the watch case. Line up your new band next to the old one so you can tell which side of the watch band belongs on each side of the watch case. Pick one side of the watch band and insert the spring bar. Take the watch case and orient it so that it is sitting on its side with the back facing you and the end that matches the watch band free. Insert the first end of the watch band into the watch case. Turn or angle the band so you can position the spring bar in the notch for it in the watch case. 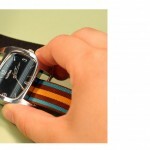 Be sure that the finished side of the watch band is facing the same direction as the watch face. Position the forked end of your spring bar tool above the donut ring on the spring bar and push down until the end is out of the way. 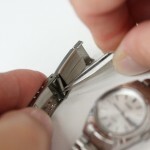 Then push the watch band into place in between the lugs in the watch case. Move the watch band around in the lugs until you feel the spring bar pop into place. Don’t worry if it takes you more than one try to get the spring bar into position. 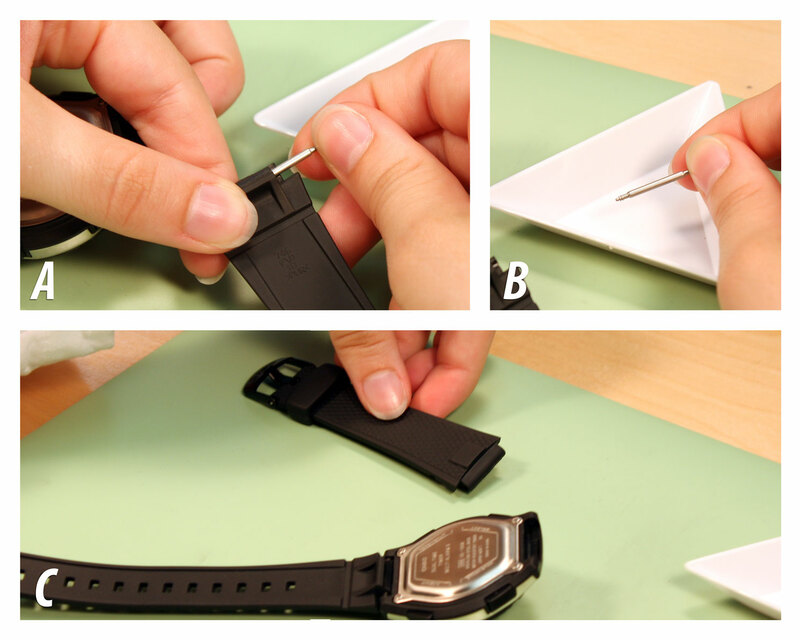 Grab the second half of the new watch band and insert the other spring bar into the band. 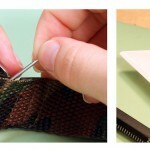 Turn the watch case around so the end without a band attached is accessible and insert the first end of the watch band into the space for it in the watch case. Position one end of the spring bar in the notch in the case. 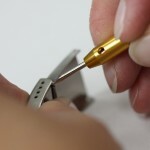 Then, use your spring bar tool’s forked end to push down the free end of the spring bar and slide the end of the watch band completely into place in the watch case. Move the end around until the spring bar pops into place. Once you are certain that both sides of the band are securely positioned in the watch case, you can put your watch on and continue to wear it again.